Nearly six months after a fuel tank blew up at the Sterling Oil plant, the company is seeking a fast-track approval to erect eight new tanks. But the City Council on Tuesday said the company will first have to address several safety issues. That didn’t sit well with one of the owners of the company, Jason Eddleston who said his customer needs to have the tanks ready as soon as possible. Fire Chief Steve Paruk said he wants to first have a fire suppression system installed over the tanks in case there is another fire. He also said he wants to have a site on the plant grounds where a special foam used in fighting fuel fires can be stored. Hamtramck firefighters ran out of the special foam in fighting last August’s fire. Fortunately, Marathon Oil was able to truck in more foam in a timely manner. That August fire had city officials worried that other fuel tanks on the plant grounds would also explode and cause a major safety problem for the city. It was one of the worst nightmares city officials had been concerned about for years. No one was injured in the fire but nearby households and the entire Col. Hamtramck public housing apartments had to be evacuated because the fire posed a serious threat. Besides addressing safety issues, the city has also issued Sterling Oil a bill to cover costs related to extinguishing the fire. The city is allowed by law to be reimbursed in cases of serious environmental fires. 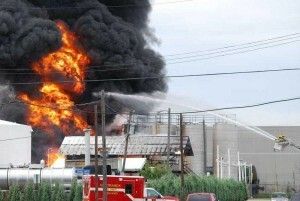 During the meeting, Sterling Oil confirmed that it is being sued by residents near the plant stemming from the fire. Chief Paruk said that the safety issues could have been resolved in September or October but he said the plant owners never returned his calls. The City Council decided to postpone making a decision on the matter until its March 9 regular meeting. In the meantime, city officials will meet with Sterling to work out the safety issues raised. City Councilmember Tom Jankowski, however, questioned whether the city should even approve additional tanks, which will contain an unspecified flammable material. Jankowski said that the only way he will approve the plan is if it includes a foam suppression unit.